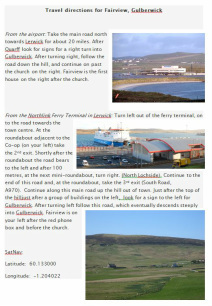 Fairview is located in the village of Gulberwick, about 10 minutes driving time from the Northlink Ferry Terminal in Lerwick if you are arriving by boat from Aberdeen, or about 40 minutes drive from Sumburgh Airport, located at the southern tip of Shetland Mainland, if you are flying in with Loganair. The map below will help you get your bearings or, if you click the link below the map, you can view a larger map which also shows driving routes. Next to the map is a link to a pdf version of the travel directions which you can download and print.